Those seeking improved sleep can switch on Sleep on Command™ device designed to enforce Delta rhythm sleep and the recovery that best occurs during deep, slow-wave, Delta-stage sleep. 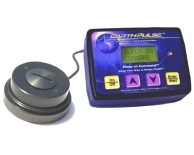 Stuart, FL, May 08, 2007 --(PR.com)-- A new sleep study published in the Proceedings of the National Academy of Sciences could provide a mechanism for what a small Florida biotech firm has known for 5 years; that artificially created Delta rhythm magnetic signals enhance and prolong deep sleep. Friday's University of Wisconsin sleep study disclosed that "With a single pulse, we were able to induce a wave that looks identical to the waves the brain makes normally during sleep." The study shows that magnetic signals may produce exactly the same effects as weak electric signals used in a recent sleep study from the University of Lubeck, Germany. In November 2006 the University of Lubeck sleep study disclosed that slowly oscillating Delta rhythm electric stimulation applied via surface electrodes on the scalp induced an immediate increase in spectral power at the same slow wave (Delta) frequency band, increased endogenous cortical slow oscillations, and increased slow spindle activity in the frontal cortex, resulting in improved slow wave sleep and subsequently better memory consolidation. Paul F. Becker, Product Developer and U.S. Patent holder, "Taken together, these two studies provide indisputable evidence that these types of pulsed signal technologies can provide relief to poor sleepers and confirms what nearly 2500 clients and I have known for up to 5 years." Becker adds, "In 2002 I developed a Delta rhythm magnetic device and discovered that rhythmic signals at Delta range frequencies improved sleep via brainwave entrainment. Entrainment as it relates to brainwaves is driving or 'guiding' the brains predominant wave signature via externally applied beat frequency stimuli." Others discovered brainwave entrainment decades ago using binaural beats (sound) and pulsating light, although it's hard to sleep with these systems due to obvious limitations. Until the U of Lubeck and U of Wisconsin studies, instantaneously improving sleep parameters via electric and magnetic stimuli had been unprecedented in the published literature. Robert O. Becker MD (The Body Electric and Cross Currents) put animals into an anesthetized state using DC current, but doing so required relatively strong current flow directly into the brain. "In my visits with Bob Becker 3 and 4 years ago he felt I was on the correct path with my device. After 5 years of promoting my sleep system, it's very satisfying to see researchers finally verifying the work I've done with Delta rhythm, magnetic signaling to enhance deep sleep," says Paul Becker. The sequenced frequency system called Sleep on Command™ was first released to the public in May 2005 and provides clients with an extraordinary sleep experience. The Sleep on Command™ trademark was filed in early 2006. An Alert Mode (low Beta wave) program was added in 2006 to aid students in studying, and to aid drivers in maintaining alertness and reducing physical and mental fatigue on long trips. It works equally well in desk job environments. Unlike the U of WI study, whose researchers describe a very specific focal point of stimulation in the brain, Becker found he could place an inductor coil anywhere on the body, the sole of the foot for instance, and produce similar sleep effects. Becker explains, "The neurological system is the most sensitive and efficient antennae ever created and carries that electronic signal to the brain." Sleep on Command™ under the mattress puts the head and torso directly inside of the sphere of influence of a very weak magnetic field and results in a far greater range of effects than when applied directly to the head. Sleep on Command™ enhances both mental and physical performance via a number of mechanisms, but most are due chiefly to deeper, sounder sleep. "Regardless of how or why the ergogenic effects occur, the largest blessing by far is simply knowing my clients are going to go to bed at night (or whatever time of day) and enjoying an excellent sleep session nearly every time," Becker says. While the U of WI study, BBC and other subsequent news articles speak of 'insomnia therapy', 'slow wave on demand', 'sleep machines' and 'magnetic power naps' being ideas for the future, Becker is quick to point out that, "Our low cost sleep technology has been available commercially since 2002 and the User Manual has contained directions for 'Power-Nap' since day one. Should anyone doubt the 'quality' of magnetically enhanced sleep vs. natural sleep they simply need to study our sleep system or try it themselves to put that reservation to bed once and for all. It's the best sleep our clients have ever had, night, after night, after night." EarthPulse Technologies, LLC is a privately held biotechnology and life sciences company specializing in the field of natural sleep and performance enhancement since 2001. The Sleep on Command™ system promotes deep sleep and enhanced mental and physical performance. Clients range from 16 year old top ranked Girls Junior Tennis players to men and woman well into their 80's, from professional golfers and UFC champions to military Special Forces. The company develops and manufactures in Bangalore, India and has thousands of satisfied clients in 16 countries. Why We Don't Sleep Well. EMF, Radiofrequency (RF) and information carrying microwave destroys sleep.